When a New York City bicycle messenger picks up an envelope at Columbia University, a dirty cop becomes desperate to get his hands on it and chases the messenger throughout the city. $6.300 million on 2255 screens. If current trends continue, by 2015, Joseph Gordon-Levitt will appear in 97.4 percent of all movies. Okay, this may be a slight exaggeration, as Gordon-Levitt “only” showed up in four 2012 flicks, but damn if it didn’t seem like more than that – it felt like you couldn’t hit the multiplex without a JGL sighting. Gordon-Levitt played supporting roles in two of the four - Lincoln and Dark Knight Rises - but he took on the lead in the other two. We’ll examine the second one - Looper - before long, but now we’ll check out Premium Rush, the first of the actor’s lead projects in 2012. New York City messenger Wilee (Gordon-Levitt) leads a dangerous life on a bike with no brakes. He actually went through law school but decided that a job in a suit wasn’t for him, so he risks life and limb on the streets of Manhattan. Wilee picks up a “premium rush” job from his ex-girlfriend’s roommate Nima (Jamie Chung). 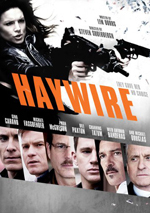 This job immediately causes troubles, as a cop named Bobby Monday (Michael Shannon) wants the envelope in the worst way. We follow Monday’s pursuit of Wilee and the delivery as well as other complications that make this more than a standard delivery. Ask most city-dwellers, and they view bike messengers negatively. These riders can cause havoc in the streets as they flout traffic laws and threaten car drivers and pedestrians with their sometimes reckless ways. This means that Rush’s greatest achievement may be the fact that it gives us likable bike messenger characters. While I don’t live in a city, I spend enough time in them that I’ve seen the messengers’ wild, irresponsible ways, so I came into the film with a negative view of these folks. Rush didn’t actually change that conception, but I did manage to like and care about its characters, so that’s a pretty substantial accomplishment right there. I suspect the actors deserve most of the credit. In particular, Gordon-Levitt does wonders with our lead character. On paper, Wilee should be a self-absorbed prick. The movie sticks him with so much arrogance and stupid lines like “brakes are death” that most other actors would’ve flopped in the part. Somehow Gordon-Levitt offers enough warmth and charisma to allow us to attach to an inherently unlikable character; as much as I wanted to loathe the cocky Wilee, I couldn’t help but root for him. Truly, every situation and character here should seem stale, as we’ve seen them all many times in many other projects. Sure, the bike messenger concept adds a twist, but otherwise, there’s nary an original thought in Rush’s pretty little head. This spreads all the way to title itself, which feels generic and like something from a bad early 90s action flick. Despite its lack of imagination, Rush still manages to produce… well, a pretty good rush. Again, there’s nothing especially original on display here; the movie even borrows the “Holmesvision” style from 2009’s Sherlock Holmes. Nonetheless, it moves at a solid pace and only rarely slows. Some of its character moments at the start seem superfluous, but they do manage to pay off eventually, so there’s little flab on display here. And even though I criticize the number of conventions we find, I will admit that Rush takes some slightly unexpected twists. None of these will blow your mind, but they add a little spice to the proceedings. All of this adds up to a fun action flick. At no point does Rush threaten to become a great – or even really good – movie but it gives us an entertaining, fast-paced thriller with just enough life to make it worth our while. 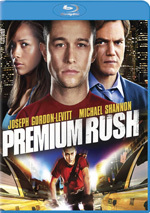 Premium Rush appears in an aspect ratio of approximately 2.40:1 on this Blu-ray Disc. The picture looked fine. Sharpness was always strong. Don’t expect any softness here, as the movie remained tight and looked accurate and concise. I noticed no jaggies or moiré effects, and edge enhancement never manifested itself. In addition, the film failed to display any print defects. Like most modern action flicks, this one opted for stylized hues, with an emphasis on an arid, yellow look mixed with some chilly blues. Within those constraints, the colors seemed positive; they showed appropriate range. Blacks were dark and full, and shadows showed good range. This was a consistently strong presentation. The DTS-HD MA 5.1 soundtrack of Rush also worked well. Various action elements offered the most active use of the spectrum. This was especially true during the many street chase scenes, as they utilized the soundscape in an engrossing manner. Music also made active use of the different channels. Audio quality pleased. Speech was concise and natural, without edginess or other issues. Music showed good range and vivacity, while effects worked nicely. Those elements came across as accurate and full, with solid low-end response and positive definition. All of this added up to a “B+”. In terms of extras, we get two featurettes. The Starting Line lasts nine minutes, 30 seconds and includes comments from writer/director David Koepp, writer John Kamps, bike trainer Nate Loyal, stunt rider Austin Horse, and actors Joseph Gordon-Levitt, Michael Shannon, Dania Ramirez, and Wolé Parks. The show looks at story/character subjects, thoughts about the bike messenger community, cast and performances, bicycle work, action and stunts. “Line” doesn’t dig into its subjects with much depth, but it delivers a breezy, moderately informative piece. Behind the Wheels fills 12 minutes, 51 seconds with notes from Kamps, Koepp, Parks, Ramirez, Gordon-Levitt, stunt coordinator Stephen Pope, Mari Jo Winkler-Ioffreda, stunt rider Danny Macaskill, 2nd unit director George Aguilar. We learn more about story, stunts and action, cinematography, shooting in NYC, and visual effects. “Wheels” acts like a companion to “Line” so it offers the same level of quality; it’s superficial but useful. The disc opens with ads for Looper and Total Recall. These also appear under Previews along with clips for Universal Soldier: Day of Reckoning and Seven Psychopaths. No trailer for Rush shows up here. Despite a general lack of originality, I enjoyed my time with Premium Rush. A solid cast and some lively action sequences enliven a project enough to allow us to ignore most of its clichés and flaws. The Blu-ray delivers solid picture and audio but skimps on bonus materials. It’s too bad the disc lacks substantial supplements, but I still recommend it as an entertaining adventure.